In this roleplaying game a bunch of the characters live in your own head. 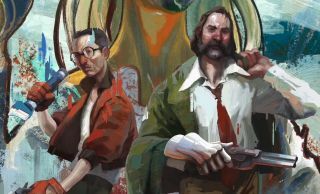 Disco Elysium is part isometric RPG, part 'hardboiled cop show', so say the developers. The game has been getting a lot of attention lately, and we've played about three hours combined of a super early build, which represents about a quarter of the game and is very much meant to be a work-in-progress. Tom Senior, online editor: Disco Elysium is ostensibly an RPG about solving a murder mystery, but you spend much of the game defining your character through internal dialogue with aspects of your personality. It’s one of the few games I’ve played where it makes sense for the protagonist to have amnesia, because without an established sense of the character you’re playing you’re free to be the freewheeling incompetent drunk detective you want to be. In Disco Elysium your personality is a state of compromise between your brain and your character’s urges, and this often has hilarious consequences. The game cleverly uses the cRPG format to simulate your internal conflicts. Your stats—volition, authority, empathy, and so on—behave like party members that live inside your character’s head. They can barge into your conversations to try to offer help. Sometimes they can take over to push social situations in unpredictable directions. You can nurture them as you would any RPG stat, but instead of increasing damage output or defence, you’re angling your character’s entire personality in that direction. I find the results completely engrossing, even when not much plot is really happening. The typical RPG approach offers you a collection of outfits to slip into: do you want to be paragon right now, or renegade? In Disco Elysium your personality is a state of compromise between your brain and your character’s urges, and this often has hilarious consequences. Thank god there are jokes in it. It would be unbearably dense otherwise. Samuel Roberts, UK editor-in-chief: "Making a mockery of yourself is a recurring theme in Disco Elysium," is what Lauren Morton said in her preview of the game earlier this month. I agree. I'm not sure about you, Tom, but my time spent with it so far mostly involved trying and failing to achieve certain things in the line of duty: being too pathetic to lift some dumbbells, injuring myself by trying to barge open a heavy door and mostly being mocked while questioning potential witnesses. Of the four 'characters' you can select at the start of this early build—there's logician, sensitive, predator and detective—I picked the last one. An all-rounder, but great at nothing. And that's how I felt. I've spent two hours wandering around the city of Revachol, looking into mysteries and little sidequests, and not achieving much. I sense this is a valid way of playing the game, though: not taking the time to rush everything, but to speak to every NPC, to investigate each detail, and to see who you can annoy in different ways. Occasionally, though, I'll have a breakthrough moment where I'll convince a shopkeeper to let me investigate the 'cursed' part of her store that's supposedly been the scourge of many businesses before this one, by convincing her I've previously investigated 'paranatural situations' even though I'm lying. I feel like I'm an idiot detective who'll sometimes happen across a break in a case by accident, because I got a lucky dice roll. And I quite like playing as a character like that. Tom, did you feel like you made much progress in investigating the actual mystery at the heart of this early part of the game? Tom: Pretty much none, and I’ve played for over an hour. I think that’s because it’s very easy to get sucked into incredibly detailed situations. Just looking in a steamed up mirror triggers a lengthy identity crisis. I used my partner’s radio to call back to base, just to see what would happen, and ended up in a long, tragically funny exchange with my colleagues. Every little situation is examined in minute detail. This could so easily get boring and frustrating, and it might feel that way to some, but I’ve enjoyed it a lot so far because the writing is so good. I can see how it will stand up to replays really well. Samuel: Oh thank heavens, I thought it was just me making no progress. I played it for a couple of hours and similarly found myself achieving very little. Like you say, it's a game of tangents where the funny writing draws you deeper and deeper into something that might go nowhere—I badgered someone reading a book outside a store who described herself as "no one, just a working class woman." Clearly, she wanted to be left alone, but I responded with "Shouldn't a working class woman be working?" in response to what the logic part of my character's brain was thinking. They're often granular conversations about nothing, and sometimes I'll just pick a dickish choice just to see the results. But they're really enjoyable, and you can keep poking at them, providing and receiving funny responses. I like that Disco Elysium superficially reminds me of older RPGs but has a totally different execution. What I did accomplish was checking out the details of a crime scene, just outside the building where you wake up. A dead body has been hanging from a tree for a week, and you have to investigate the circumstances behind it. First of all, my character vomited twice just while trying to get a closer look at and remove the body, even though I'd gone looking for something that could prevent that the second time. But then I pieced together that the nearby boot prints probably belong to some dock workers, and I started to get a sense of why they might have had a motive to murder this particular person. I like that Disco Elysium superficially reminds me of older RPGs but has a totally different execution. I could see myself just wandering around the city, talking to as many people as possible, and stumbling across progress to the actual case. Tom: Even the art is a cool mashup of ‘70s cop show and futuristic shanty town. It’s grotesque in the truest sense of the word, comically twisted and ugly. You wake up after a massive bender and everyone is cross with you because you were supposed to clean up the corpse in the yard that’s been there for a week now. You’re a bleary, boozy cigarette monster but no-one can quite bring themselves to tell you to sod off because you’re police. I hope the murder mystery gives the game enough momentum to keep me hooked beyond this first area. I don’t have a sense of how long the game is going to be from the first hour, but I expect each person’s playthrough will vary depending on how far you want to poke and prod every single object. It’s one of the most interesting RPGs I’ve played in ages, because it uses old fashioned systems to simulate social situations to a level of detail I’m not used to in games. I left the building I woke up in and asked an NPC for directions. In the middle of a polite conversation one of my traits rolled an impromptu perception check and informed me that the woman was black. It’s a brilliant demonstration of implicit bias, and it shows how the personality system can explore important themes. If the rest of the game can keep this level of inventiveness going for its duration, it's going to be quite special.